You need to check your local area city, state, town or council to find out what permits are required, if any. Using shipping container architecture has its benefits as well as a few cons but overall it can be very nice housing for anyone who wishes to employ the use of it to provide ease of mind when it comes to the safety of both break-ins and structural integrity. It can also be eco-friendly and certainly no more costly than building a normal home, while also, it is ready to move in at. Our case study is a property in Brisbane, Australia, made out of 31 shipping containers, which is a one-off bespoke design by experienced builder Todd Miller of Zeigler Build. Positioned on 706 square metres in Graceville, the spectacular home stands out in a quiet neighbourhood of more older-style Queensland properties. Over three levels it features clean lines, open spaces and quality finishes. Glass maximises natural light and a mix of materials, including the signature containers, cleverly used to stylish industrial effect. 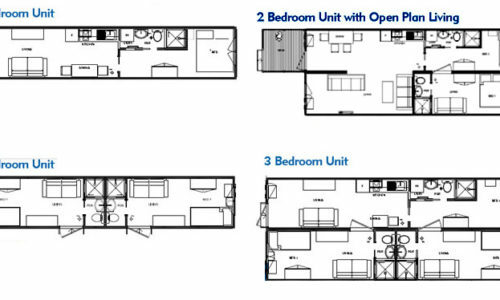 There are four bedrooms positioned over two levels. The master encompasses the entire upper level, with walk-in robes and a private ensuites. Other features include a mezzanine reading room, a pull out queen wall bed in the rumpus room, an art study, workshop, gym space, water tank and saltwater pool. Environmentally friendly, it’s solar ready and has been constructed to flood codes – a must in Queensland thesedays.